I’m so, so glad I used an Audible credit for this book. It’s so, so worth it! The plot is gripping right from tbe start, and each scene and each chapter were all well thought of, and the storytelling of both narrators were so on point, giving it’s listeners an impressionable reading (or listening) experience. I can’t wait for the next book in the series, HIRED! - The endless references for the people who Adam and Becky knew personally were funny as hell. 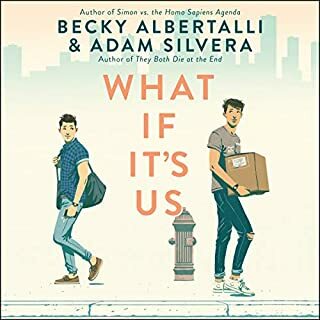 Like the Bray-Eliopulos Files (based on Becky and Adam’s editors respectively), Café Arvin (based on Arvin Ahmadi), Angie Whaley (based on Angie Thomas), Brooks Teague (based on their agent, Brooks Sherman), Dylan (based on David Arnold), and Jessie (based on Jasmine Warga)*. - The way that New York City was mapped out got me fascinated! I loved getting these small glimpses of what the city looked like, and I can’t wait to visit and check the places out for myself. - I absolutely adored Arthur and Ben’s character and relationship development. They started out being this cute but awkward couple and to see them grow individually and as a couple brought me to actual tears.